Dave Challinor was delighted his AFC Fylde side wasted no time in picking up three points in the National League. It took six games for the Coasters to pick up a victory last season, but this time round his men wasted no time in recording three points in their 2-1 opening day win against Bromley. But there is no rest for Fylde, who are back in action with their first away game of the season at Wrexham tonight. 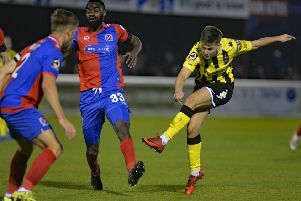 “It was pleasing to win on Saturday and get three points on the board and hopefully we can take that into the game against Wrexham,” Challinor told The Gazette. “The first game of the season is just the start of the process. Obviously last season it took us a while to pick up our first win so to get the three points straight away this time round is great. “Now it’s down to us to put a run together through August where there’s a lot of games in a short space of time. It’s the same in September. “How you start the season can have a big impact on what you do, so hopefully we can build on that in what will be a tough game on Tuesday. “It’s one we’re looking forward to because we’re in a good place. “It’s hard to say how sides will do but you’d expect Wrexham to be in and around it. “They have an experienced group and they’ve added to it. A new manager has come in and he will be looking to stamp his style on the team. Last week, Fylde chairman David Haythornwaite told The Gazette Danny Rowe had been the subject of two rejected bids from League Two side Cheltenham Town. As far as Challinor concerned, there has been no change. “There’s nothing to update from the weekend,” he added. “Obviously he scored an unbelievable goal on Saturday but, certainly from my perspective, I’ve heard no change. “I don’t particularly think there will be either. If something happens between Tuesday’s game and Thursday’s deadline then it is what it is. “If not we will carry on as we are. But obviously we’ve got to be a bit proactive and look at potential things that are available for us. If we have to be reactive, we will be.